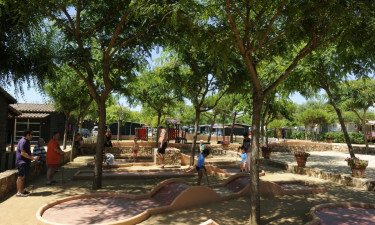 Just a short stroll from the fishing village of Malgrat de Mar, in Catalonia, Spain, you’ll find luxury camping at camping park Del Mar. This family-friendly campsite is perfect for a family vacation in the hot sun on a sandy beach! You can also find the famous tourist destination of Barcelona on Spain’s breathtaking Costa Brava coast on the Mediterranean Sea which is just a short drive to the south-west of Del Mar. 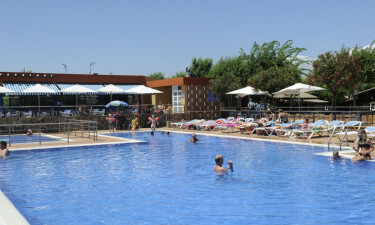 The area that surrounds campsite Del Mar and Malgrat de Mar is called Costa Brava. This region is an exceptional area to explore that has plenty of nature parks to cycle or hike through. Book your next camping holiday at Del Mar through LuxCamp today to benefit from these features. Why choose camping Del Mar? The pool onsite at luxury camping site Del Mar has different depths for any swimmer, experienced or not. There’s also a separate kiddy pool for the children as well. Camping park Del Mar couldn’t have such a name without direct beach access, and well, it does! 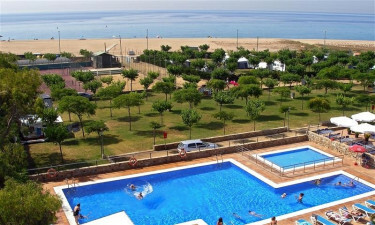 The campsite has its own beach, with plenty of other beaches to explore nearby up and down Costa Brava.